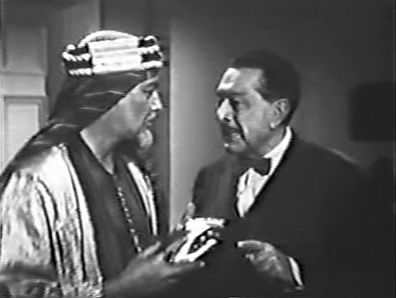 Episode 28: "The Hand of Hera Dass"
In Nice, France, Mr. Dubois wishes to hire Charlie Chan to receive a package from a man named Herun Ali in Cairo, Egypt. Offering to pay handsomely for the job but offering no details, Chan declines. Dubois explains that it is a matter of international importance that he bring the Hand of Hera Dass, an ancient relic, to him within 48 hours. If not, it could bring about conflict in the Middle East. In Cairo, waiting in their steamy hotel room, Chan and Barry await the delivery of the hand. A knock at their door marks the arrival of the mysterious Herun Ali. Quickly passing the relic to Chan and departing, a loud groan is suddenly heard outside their door. Ali stumbles into their room and collapses, mortally stabbed. Before dying, he is able to tell Chan, "Find Hakim – and hide the hand." Hearing another noise outside, a veiled woman, Yasmin Rachid, is let in. Distraught upon seeing the lifeless Ali, Yasmin states that Ali's killer is a one-eyed, cruel man named Ahmed. When asked if Ahmed has taken the Hand of Hera Dass, Chan feigns ignorance, claiming to be a simple tourist. Wishing to leave before the police arrive and thus avoid a scandal due to the fact that Ali, Yasmin's fiancé, was of a lower social class than her, is then escorted home by Barry. As Barry leaves her at her residence, he sees her leave. Following Yasmin, Barry is also followed himself by two men. After seeing Yasmin meet with the one-eyed Hakim, and then leaving with him, Barry is suddenly attacked by the two men. Reading his passport, they see that he is Barry Chan, son of Charlie Chan. At Chan’s hotel room, the police inspector has just completed interviewing the detective, who awaits the overdue Barry. After the inspector leaves, the two men who had followed Barry earlier barge into the room. Chan determines that the two are after the hand for personal gain. Knowing that a knock at the door is probably Barry, Chan pretends that it is the police inspector. Barry, understanding and following along with his father's ruse, plays along causing the thieves to flee through the back door. Another person, an older man named Fasil al Salid, soon arrives, claiming that the hand, rightfully his, was stolen from him. He explains its true significance to Chan and Barry and how it has kept peace among hostile tribal factions for generations and how, without the hand, there could be war in the region. Chan wishes to hold on to the hand in order to use it for bait to capture the murderer of Herun Ali. Meanwhile, Ahmed plots with the two thieves, agreeing to pay them generously for the delivery of the hand. Yasmin returns to Chan's room, telling him that she wants the hand in order to return it to its true owner. Entering the room, Ahmed and the two thieves tells a different story; Yasmin is simply after the money that the hand could bring her. Chan tells Ahmed that his only desire is to find the killer of Herun Ali. To this, Ahmed reveals that Yasmin is the killer. A brawl ensues, and as Yasmin accuses Ahmed, the police inspector enters with his men to take Yasmin, Ahmed and his men away. Chan states that he believes neither Yasmin nor Ahmed killed Ali. Rather, he feels that it was the person named by the dying Herun – someone named Hakim. Flying back to Nice with the hand, Chan and Barry make the promised delivery to Dubois. Noting Dubois' pronounced limp, he accuses him of being the mysterious Hakim, the one who killed Herun Ali. Not trusting Herun, Dubois had traveled to Cairo and killed himfearing that he would keep the hand for himself. At that moment, Fasil al Salid makes a surprise entrance, placing further condemnation on Dubois, who, trying to escape, is thwarted by Chan and Barry. Chan gives the Hand of Hera Dass to al Salid, its rightful owner, and the threat of conflict in the Middle East is averted. Yasmin (to Charlie Chan): "Oh, I have heard of you, of course." The Hotel Negressco (seen above), where Charlie Chan and Number One Son, Barry, stayed while in Nice, France. 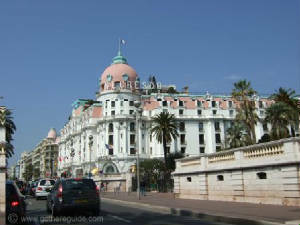 It was built in 1912 by a successful Romanian immigrant, Henri Negresco, and overlooks the Mediterranean Sea. The distinctive pink dome was designed by Gustave Eiffel. Today, the Hotel Negresco is listed by the government of France as a National Historic Building. Man is optimistic creature who forever expects tap on door to fortell arrival of beauty.